Da-Q, real name Ji Cheng, is a friend of mine who proves the myth that Chinese people are naturally short and slim is false. Very false. At least six feet five inches tall and three hundred pounds false. Could kill you in one punch false. You get the idea. 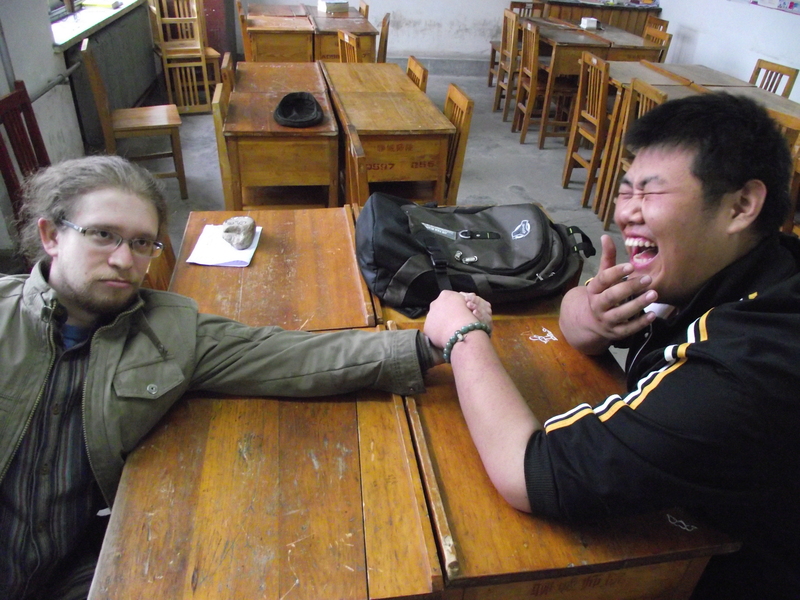 Last Friday, most likely just to amuse himself, he challenged me and Yvon to an arm wrestling contest. Around the corner from the Foreign Expert Village there is a steadily growing snack vendor village gathering under the trees outside the south gate of eastern campus. At first there were just a handful of vendors selling fruit or services such as bicycle or shoe repair. Now, since the miserable Liaocheng winter has finally receded for good, the food vendors have arrived. Green Bean noodle vendors, soy milk carts, sauced bread vendors, sausage stands. Vendors with giant pots of boiling who knows what. I made my way through the throng, narrowly avoiding a guy with swept back greased hair, wearing a leather jacket and riding a red motorcycle weaving through the stands. College students gather under the shade to slurp fresh qundun (wonton soup). A vendor shouted at me with a “I know you want to buy one” smile on her face “Dou jian ma?” I consented and bought a cup of fresh soy milk and continued through the small but expanding village on my way to the Dumpling House. The Dumpling House, usually quiet was bustling today. The restaurant has four tables and sits maybe 12 people comfortably. The eating side of the place is about the size of my bedroom in my apartment- maybe 10×12 feet or so. The clientele seems to be college students, construction workers and drunk business men. And me. Everyone is mostly friendly. I hear people talking about me there but no one stares. The owners, affectionately known as Mom and Pop to some, are warm, friendly, smiley people who only seem to attract similarly friendly and smiley people to their little establishment. Best dumplings in all of Shandong Province- try the the mutton or egg and chive dumplings- Yummilicious! My overall experience in China can best be illustrated through my interactions with the colorful local characters that fill this place. I will try to post a few characters each week. Behind the five story student center which houses two pool clubs, a seemingly disproportionate number of beauty supply stores and lingerie shops, a gym, stationary stores, convenience and random stuff stores, two canteens, and a grocery store, lies a short alley with a line of fruit stands at the end. Facing the fruit stands (attached to the rear of the student center) are more fruit stands, tailor shops, beauty salons and two bicycle repair workshops. One such workshop is run by two older kids, one boy and one girl maybe in their late teens and sometimes an older woman who is potentially their mother/aunt. They run a messy but professional shop. The team operates out of a little shack but work on the bicycles outside, wedged between the fruit stands and a combination tailor shop/beauty salon. The funny thing is, these kids always wear shined and polished dress shoes, mini skirts and freshly ironed slacks. Except for the grease stained mechanic’s gloves, they look as if they are going to a job interview or a prom. Next time I see those crazy kids, I’ll take a photo with them and post it. The first time I saw the janitor of the foreign language building he was teetering jovially down the hallway, little bright eyes and wide grin shining from his dusty face. The second time I met him, he was climbing out of the crawlspace like some subterranean monkey, his smile gleaming even in the dim light. Vance, the TA (a quiet man who means well) asked him if he knew where the keys to my office was. The janitor shrugged his shoulders and guffawed joyfully. I couldn’t have been angry with him if I wanted to. That little monkey of a man radiates silly happiness. His words burble out of his mouth like a merry stream over rocks. Vance and I set out to look for the keys elsewhere with the janitor bobbing behind us, burbling as he came. Yvon, a good friend of mine who is Chinese, asked the janitor a question, who responded and tootled off. Yvon turned to me and whispered “I couldn’t understand anything he said.” Does the janitor even use real words at all? I have had conversations with this silly man without either of us using any intelligible words. We speak in clown language. Yvon and I had come back to the campus after a shopping trip. My bicycle was locked inside the Foreign Language Building and the janitor was nowhere to be found. It was quickly approaching ten thirty and Yvon had to go back to his dorm or be locked out. I stationed myself in front of a window of the janitor’s office, which is also his home. It was ten forty-five now and the street lights on campus had all been turned off. When the janitor walked into his off and saw me standing helpless in the window he nearly jumped out of his skin and fell backwards. I said “I didn’t mean to scare you. I locked my bicycle inside!” and gestured wildly. He knew exactly what I was talking about. He unlocked the building and turned on the lights in the hallway where my bike was stored. He didn’t understand a thing I said and vice versa, yet we understood everything that was said.